Does your family’s emergency plan include your animals? 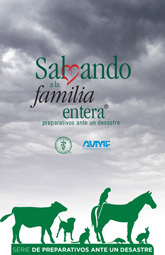 Planning and preparation are critical when it comes to protecting the health of your family, pets and livestock. This booklet includes detailed information on assembling emergency kits and plans for a wide variety of animal species. Written in Spanish.